How long is this government program good for? What is a Conditional Certification from the State Workforce Agency? What is the minimum length of employment to claim credits? I hired a Veteran 4 months ago, can I go retro to claim the tax credit? If I had a new hire who would of qualified and it is after the 28 days, can I release them and re-hire to meet the 28 day rule? Does an employee have to live in & work to qualify for the empowerment zone tax credit? What are the Empowerment Zone Employment Tax Credit regulations under General Business Credits? For the Empowerment Zone Employment Tax Credit are there any thresholds? What is a Rural Renewal Community ”RRC”? How do we know if the Employee is in an Empowerment Zone? How do I claim the WOTC Tax Credit? Can I go back and amend our returns? Can I carry forward tax credits not used? How much is CMS’s service? Who do I call to get more information? The Work Opportunity Tax Credit (WOTC) is a Federal tax credit incentive that Congress provides to employers for hiring individuals from certain target groups who have consistently faced significant barriers to employment. The main objective of this program is to enable the targeted employees to gradually move from economic dependency into self-sufficiency as they earn a steady income and become contributing taxpayers, while participating employers are compensated by being able to reduce their federal income tax liability. WOTC joins other workforce programs that help incentivize workplace diversity and facilitate access to good jobs for American workers. 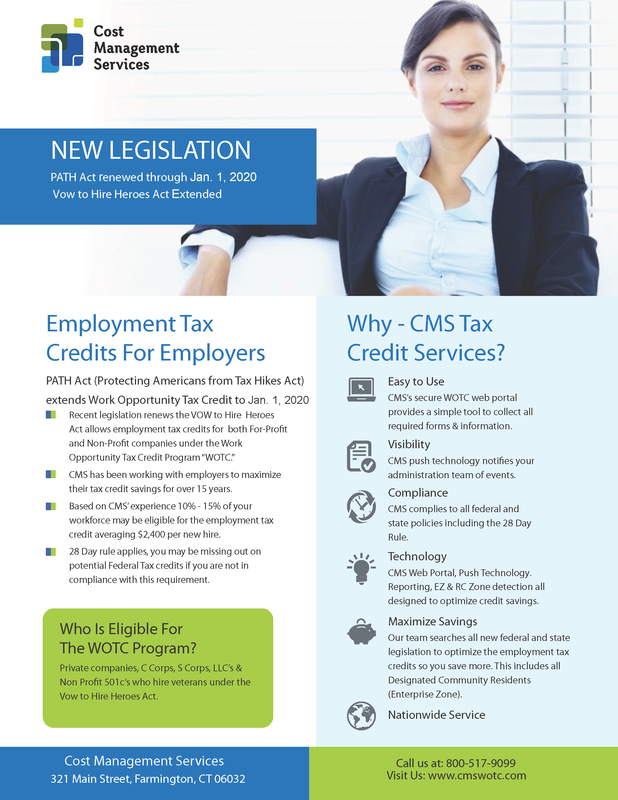 As of now, the Work Opportunity Tax Credit program is in effect till January 1st, 2020. Based on our 15 years of experience, 10-20% of new hires may be qualified if they are included in the target groups. Employees who are family members and people who have previously worked for you (rehires) are not eligible. The amount of the tax credit varies by target group. The tax credit for target groups A, B, C, D, E, G, and H is 40 percent of qualified first year wages up to $6,000 if the individual is retained for at least 400 hours. If the individual is retained less than 400 hours but at least 120 hours a 25 percent tax credit is available on qualified first year wages up to $6,000. The tax credit for target group I, long-term family assistance recipient, is 40 percent of first year qualified wages up to $10,000 and 50 percent of second year qualified wages up to $10,000. The individual must be retained at least 180 days or 400 hours. In certain circumstances you may be able to claim either the 40 percent of $6,000 tax credit or the 40 percent of $10,000 tax credit. Veterans with a service-connected disability unemployed for at least 6 months with the qualified wages cap increased to $24,000 and the maximum tax credit increased to $9,600. The WOTC amount an employer claims depends on the number of hours the employee works. All new employees must work a minimum of 120 or 400 hours. The credit is 25% of qualified first-year wages (up to $6,000) for those employed at least 120 hours but fewer than 400 hours, and 40% for those employed 400 hours or more. The legislation requires the application for the tax credit is received by the Department of Labor (DOL) within 28 days of the employees hire date. Unfortunately you can not. You need to apply within 28 days of the hire date. If I had a new hire who would have qualified and it is after the 28 days, can I release them and re-hire to meet the 28 day rule? Good try, however the WOTC program is designed to provide Employers an incentive for hiring new employees. So re-hires do not qualify for tax incentives. The new employee only has to live in the empowerment zone; however the new employee living in the Empowerment Zone must be between the ages for 18 – 39. For tax years that include December 31, 2012, the credit is 20% of the employer’s qualified wages (up to $15,000) paid or incurred during calendar year 2012 on behalf of qualified empowerment zone employees. – Has his or her principal residence within that empowerment zone while performing those services (employees who work in the Washington, DC empowerment zone. Yes, generally an individual needs to be employed at least 90 days to qualify. A Rural Renewal County is a county outside a metropolitan statistical area that during the five-year periods 1990 to 1994 and 1995 to 1999 had a net population loss. CMS can provide a list that you may benefit from. For taxable employers, the WOTC may be claimed for hiring targeted group members, including qualified veterans, who begin work before Jan.1, 2014. After the required certification is secured, taxable employers claim the tax credit as a general business credit against their income tax. The process for taxable employers claiming the WOTC remains the same. Qualified tax-exempt organizations described in IRC Section 501(c) and exempt from taxation under IRC Section 501(a), may claim the credit for qualified veterans who begin work on or after Nov. 22, 2011, and before Jan.1, 2014. Tax-exempt employers may not claim the WOTC for other targeted group members. After the required certification is secured, tax-exempt employers claim the credit against the employer social security tax by separately filing Form 5884-C, Work Opportunity Credit for Qualified Tax-Exempt Organizations Hiring Qualified Veterans (PDF). File Form 5884-C after filing the related employment tax return for the employment tax period for which the credit is claimed. It is recommended that qualified tax-exempt employers do not reduce their required deposits in anticipation of any credit as the forms are processed separately. Employers may claim the Work Opportunity Tax Credit for a total of two years. Employers who do not take the full credit amount because of the tax liability limitation may carry back one year or forward 20 years. Employers claim the tax credit for the year they “realize” the credit i.e. employee hired in 2012, received voucher in 2014, tracked hours and wages for eligibility for full credit in 2014. Yes, the IRS will allow a return amending a timely-filed return. Amended returns generally must be filed by the later of 3 years after the filing date of the original return or 2 years after the tax is paid. Example – The date is 3/15/2013 & we are working on 2012. But CMS was able to go back and acquire a significant amount ($100,000.00) of WOTC credits accumulated in 2009 for use on our 2010 return (i.e. Refund). Yes, WOTC tax credits rules are the same as general business credits. You can carry forward unused tax credits for up to twenty (20) years & back one (1) year. Your employees fill out the IRS forms 850 and 9061 as part of their new hire paperwork. If using CMS’s WOTC services, you can use our online portal, or mail the forms to us for processing, verification and certification tracking within 28 days of the employees start date. At CMS, we automate your application, certification and tracking of the Work Opportunity Tax Credit. We only get paid after we have received the government agency certification and verified that your employees qualify for tax credits. (See more about our WOTC services). We are an employment tax credit expert whom not only performs a full screening process, but also helps you maximize tax credits and comply with federal policies. CMS will invoice after we perform all the work & determine the actual value of the tax credit. It’s the only invoice you want to see!! If you have any questions please call CMS work opportunity tax credit experts at 1-800-517-9099.